Glossy_Bags is rated 5.0 out of 5 by 2. Rated 5 out of 5 by tobysprops from Great bags Great bags. Fast delivery. Exactly what I was looking for. Rated 5 out of 5 by Nikki08 from Excellent Quality! I ordered 10 Pink Glossy X-Large Bags and 10 Baby Blue Glossy X-Large Bags. The bags were delivered on time and the quality of the product was excellent. I was able to place all of my goodies neatly into each bag without the bag tearing. It is a very sturdy bag. I was very pleased. Hi there, Are the 6 1/2 x 6 1/2 x 3 1/2 bags 6 1/2 inches tall, 6 1/2 inches long across the bottom and 3 1/2 inches deep from front to back? Thanks! That's correct! Thanks for the question! Are the medium size bags, 8&quot;wide x 4&quot; deep x 10&quot; tall? or 8&quot;wide x 10&quot; deep x 4&quot; tall? The medium size bags are 8 inches wide, 10 inches tall, and 4 inches deep. Thanks for the question!! Hi, do you have this in black and does this company customize? They do not have cardboard pieces on the bottom. Sorry for any inconvenience this may cause. Is this a bundle, 4 bags for $4:00? or a single bag for $4:00? It is one bag for $4.00. How much weight can the 14&quot; x14&quot; x 8&quot; glossy black bag carry? I would say 2-3 pounds. 3 pounds being the max. Thanks for the question! Hi, Do you also provide printing of company logo on these? Interested in 100 to start in the smallest size. thanks. Hello, JAM does not provide any printing services, but we do have a directory for printers near you! I've linked the directory below. http://www.jampaper.com/printers-near-you.asp Thanks! Some people think that gift bags are not as fun to open as a wrapped box, but these glossy gift bags prove that theory wrong tenfold. Having the perfect shine, our glossy gift bags will stand out from the rest of the presents in the group. And with the amount of colors to choose from, you are sure to find a glossy bag that matches the occasion you're going to. From a fancy wedding that needs some silver or gold to a cute summer block party that needs some lime green and fuchsia, these bags will be able to fit any need. And our sizes are great for any type of gift - from a small necklace to a ton of clothes, to an awesomely large nerf gun. These shiny bags are essential for your next gift! Our motto is 'Every Color, Every Size' for a reason! 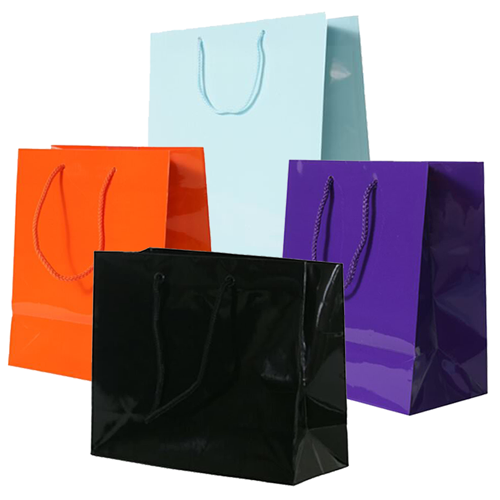 Glossy Gift Bags are available in more than ten different colors and ten different sizes. Bags feature matching soft rope handles that add a cute yet practical touch.